Ben Peek has written a book. He has written a book largely about himself. He has split it into three threads, mixed the threads together, and ordered them into entries arranged alphabetically. He has called it Twenty-Six Lies/One Truth . The book talks in some detail about Peek's early life growing up in a working-class Sydney suburb, expends a good deal of thought on the phenomenon of lying, discredited, fraudulent writers, and then discusses a relationship he had with a girl he calls G.
In 1879, Henry James wrote a biography of Nathaniel Hawthorne, a writer perhaps now most famous for writing The Scarlet Letter . In his introduction, James expressed surprise that Hawthorne had lived so uneventful a life—"few men of equal genius and equal eminence could have led, on the whole, a simpler life," he wrote. This line has always struck me as odd, since it seems no more necessary—and no more likely—for a writer to live an exciting life than it does for a street cleaner to do so. Ben Peek has subtitled his book "The Autobiography of a Man Who Has Been Nowhere, Done Nothing and Met Nobody." And then he has made a lot of it up anyhow. One of the most prominent threads in Peek's autobiography concerns literary tricksters such as Helen Demidenko, who wrote a novel about the midcentury Ukrainian experience, won an award for it, and was then revealed to in truth be called Helen Darville; like Konrad Kujau, the forger of the Hitler Diaries ; or like Ern Malley, an immigrant Australian poet of the 1920s who never existed beyond the imaginations of two poets on a mission to satirise Australian literature. Through stories like this, Peek explores the act of literary creation, asking why it matters where an author comes from if their work feels true, or how we can ever tell if an author means it, anyway. A principal autobiographical section of the book takes place in Brisbane. Peek has never lived in Brisbane. I know, because one of the entries under "Z" tells me so. Peek is a bit too clever, a bit too cute, for his own good. Sometimes his book reads like the literary equivalent of an actor repeatedly turning to the camera and winking at the audience. At other times, he most resembles the guy who sits next to you at the bar and spends the next three hours deconstructing the world from his own narrow perspective. Peek does it very eloquently and with fewer slurs, but the reader is sometimes left with the same weary wish that he'd just shut up. The second entry in this book is "Autobiography." Under it, Peek writes, "How much can you trust authors who write their own history?" Twenty-Six Lies/One Truth has a point to make, and, by God, the book will bang on about it until the damn thing is blunt. Peek can write movingly, though. His entries about his depression, and those which touch on his deeper feelings for the women in his life, are quietly affecting. The dialogues he includes show a talent for capturing the patterns of speech engagingly and naturally. And the book is satisfyingly interconnected—each entry illuminates another, and whilst the ultimate effect of this over so slim a volume is the sense that we are circling a subject like an underachieving obsessive-compulsive, there is plenty of food for thought during the flight. What most clearly proceeds from Peek's book is the idea that we create stories to make sense of things—from religion to self-mythology, we make stuff up so as to feel comfortable with ourselves in the world. There are ten entries filed under "I," but they share only two headings—Image and Identity. And when Peek and his girlfriend discuss the precarious state of the world, they come to the conclusion that the only way to not go mad is to pretend it's not happening. Peek lies twenty-six times, but he stumbles towards a universal truth anyhow. With more art and less ranting, Susan Palwick has reached a rather similar conclusion. 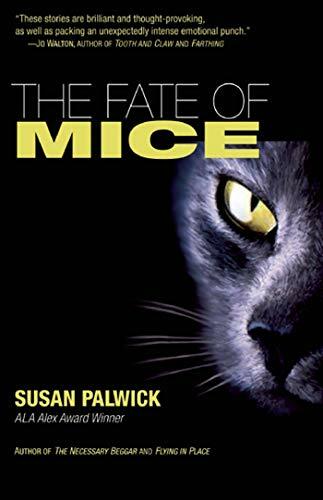 There is a story in her recent collection of short fiction from across her twenty-year career, The Fate of Mice , called "Gestella." In it, a female werewolf meets and marries an ambitious academic who, at each full moon, becomes not her husband but her owner, treating her wolf form with kindness and respect, taking it out for walks and feeding it the best meat. In her human form, Stella is a strikingly beautiful young woman, but she ages at the rate of any other canine—7 times faster than humans. The reward she receives for giving her life to another, for trusting him and standing by him like any man's best friend would, is to be traded in for a younger model as soon as she grows too old. She has never lived a life of her own, and has nothing to show for the life she has helped live. In another writer's hands, such a bald conceit could be rendered clumsy and preachy. Palwick, however, is a writer of rare delicacy, and "Gestella" is a quiet study of a life willingly given away by someone who realises too late that she has failed in fact to live. In his introduction to the collection, Paul Di Filippo identifies mortality as Palwick's major preoccupation—the spectre of death which lies before us all, and how we cope with what is potentially an inevitability which makes all we put before it wholly redundant. Palwick has concluded that what we should do—what we do far too little of—is live well. 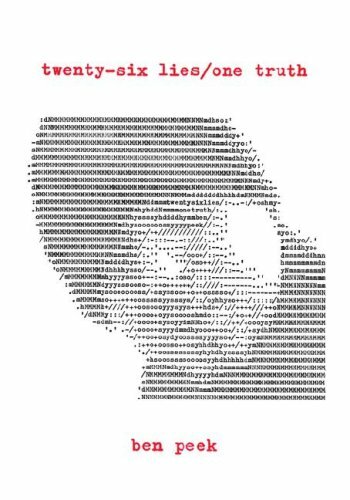 So in the collection's title story, a mouse with an enhanced IQ learns that he will one day die and contrives to escape his cage to explore the world before he expires. "You aren't keeping me safe from life," he tells the scientist using him for research. "You're denying me life" (p. 15). The mouse is scared before he runs, fears never being able to tell anyone about his adventures or his discoveries, but ultimately he runs anyway. It's the only choice he has. In the broadest story in the book, "Beautiful Stuff," crowds killed in a terrorist attack are brought back to life by a politician looking to wage a war in their martyred names. The chosen spokesman of the dead instead urges his audience to live kind, full lives, to enjoy the wonderful things life has to offer. "You don't have that when you're dead. That's why dying hurts" (p. 131). Like Peek and his girlfriend, for Palwick's characters the only way to cope with the idea that we will all die is to ignore it—to live anyway. There is just a single weaker story in the collection—the updated but unengaging fairytale "Ever After"—which means that The Fate of Mice has an unusually high hit rate. The stories are wide-ranging, too—from "Sorrel's Heart," set in a postapocalyptic landscape where mutated "freaks" hide from terrified, violent, bigoted humans, to "Going After Bobo," a wholly mimetic story about a dysfunctional family working out how to function again. In the World Fantasy Award finalist "GI Jesus," one character says, "If you love God, it seems to me you've got to love people too, since God's supposed to love them" (p. 214). This simple tenet is at the heart of Palwick's fiction. There was one thing thing Henry James wrote about Nathaniel Hawthorne with which I can agree: "He combined in a singular degree the spontaneity of the imagination with a haunting care for moral problems." The same can be said of Susan Palwick, who in "Stormdusk" takes some standard fantasy tropes—nymphs, faeries, magic, and human dominion—and weaves a fundamentally human tale from them. 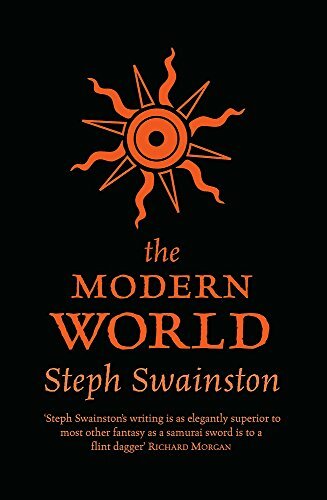 It is not, perhaps, as good a description of Steph Swainston, whose third book in her Fourlands fantasy series, The Modern World , was recently published in the UK by Gollancz and in the US by Eos, where it goes under the significantly more hideous title of Dangerous Offspring . Let me be up-front: I'm not sure I've ever forgiven Swainston for writing more than one Fourlands book. I enjoyed her 2005 debut, The Year of Our War , though I confess to skim-reading parts of it, principally for the fact that it was so slim a work and that, crucially, it stood alone. The series is so standard a means of writing fantasy that it felt daringly liberating to be reading a three-hundred-page novel with few aspirations to be anything other than itself. I should have recognised the warning signs when the original hardback's deliriously beautiful cover painting by Edward Miller was abandoned in subsequent editions because the central figure's wings were anatomically incorrect. So is it ever with series fantasy—the persnickety detail will inevitably overwhelm the overall aesthetic. The Modern World performs a similar trick to both The Year of Our War and its first sequel, No Present like Time : it mixes up the Fourlands' centuries-long stalemate of a war against the ferocious Insects with the personal lives of the immortals chosen to lead that war, and in particular the travails of their Messenger, Jant, the only sentient being capable of flight in the Fourlands. Lumped in with the New Weird nonmovement, Swainston's books play fast and loose with the traditions of fantasy—though the armies of the books fight with swords and arrows, they are also often joined by embedded reporters, and Jant wears eye makeup and takes drugs. In the first volume, this was amusing. By the third, it is beginning to feel shallow. The more we are exposed to the Fourlands, the more we wonder how it really works. Ultimately, I'm not sure it does. The books have their trump cards in Swainston's characters, however: in the immortal Circle she has the chance to create some larger-than-life flawed heroes, and watching them interact is one of the greatest pleasures her novels have to offer. She seeks in the latest volume to give the oldest of them—Lightning, the peerless archer, and Rayne, the Fourlands' finest doctor—backstories which help make sense of and humanise them. Unfortunately, she packs all this juicy gossip into the back end of the book, filling its first half with forgettably episodic fare which takes too long setting up the novel's plot. 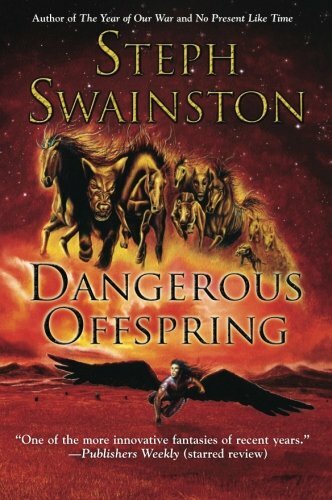 The second half of the book barrels along, and its climactic battle against the Insects is probably the best sustained piece of writing in any of Swainston's books, but she makes it hard work to get there. If the Fourlands novels are increasingly self-conscious—or perhaps their knowing winks, like Peek's, have simply outstayed their welcome—then The Modern World at least manages to be in places gripping. In other parts, however, it feels like it's going over old ground: the visit to the alternate world of the Shift, now obligatory, feels exactly that, whilst the very implacable nature of the Insects gives the war against them an inert quality Swainston has tried her best to hide with revelations about the monsters' origins but still can't quite shake. There are perhaps too many characters too, and some of them—particularly, unfortunately, the female ones—are given a shorter shrift than might be welcome. In short, The Modern World is okay but fails to impress as anything new. Which, given that The Year of Our War promised something more from its author, seems a disappointment. Under the entry for "Truthiness" in Twenty-Six Lies and One Truth , Ben Peek asks, "What is it that I have the authority to write about?" In the age of the Internet, authority is a topic much discussed, but ultimately it seems a question incorrectly framed. The question should be: what is it that a writer has the passion to write about? As Peek begins to understand in the public's reaction to James Frey's widely successful hoax, A Million Little Pieces , the reader cares less about reliability in fiction than she does about believability—how a work maps onto her own experiences and convinces her of its "truthiness." Maybe it's in precisely that difference between relevance and indulgence that the key to Palwick's success, and Swainston's frustrating promise, really lies. Dan Hartland has been doing this too long to think anyone cares who he is.